AWA believes the Siffleur Wilderness must continue to be carefully protected and managed as a Wilderness Area so that it can serve as an important wilderness benchmark for generations to come. 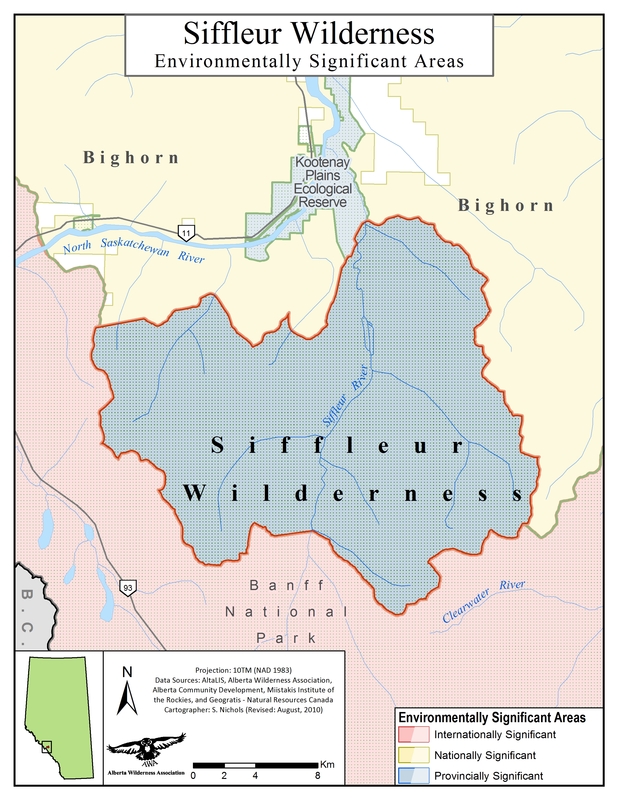 Formal protection of adjacent lands (the Bighorn) as a Wildland Provincial Park would better support protection of the Siffleur Wilderness. At 425 km2, Siffleur Wilderness Area is small by wilderness standards but it contains some of the most spectacular scenery in the Eastern Slopes. 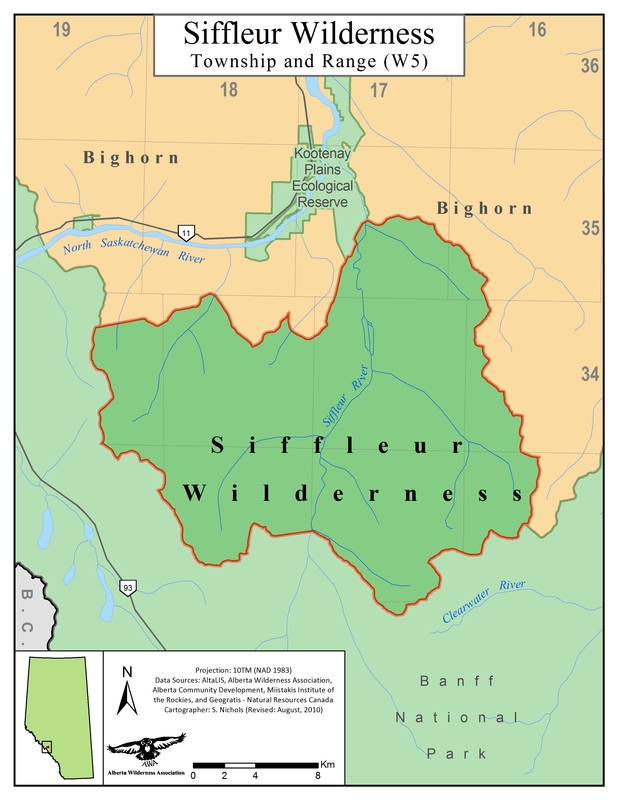 Bordering Banff National Park on the eastern park boundary, the Siffleur is located about 11km south of the Bighorn Dam, with the Siffleur River running through the middle of the Wilderness Area. The Siffleur is one of three Wilderness Areas, the others being the White Goat and the Ghost River Wilderness. 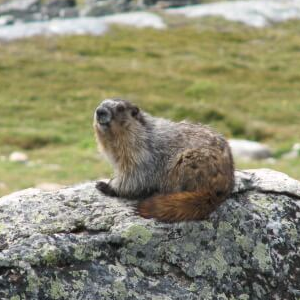 Together, they cover 1010km2 and are among the most strictly protected areas in Canada . 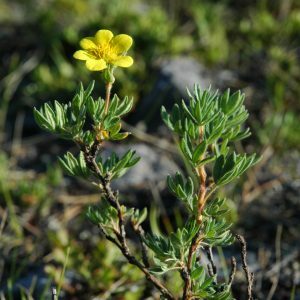 It is a “benchmark” wilderness or “living museum” where collecting of plants, fossils and artifacts is illegal without a permit. AWA believes the Siffleur must continue to be carefully protected and managed as a Wilderness Area so that it can serve as an important benchmark for generations to come. 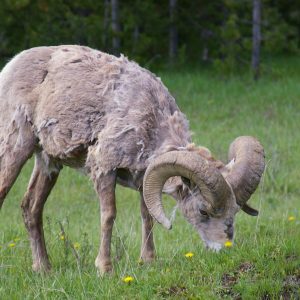 This would include formal protection of adjacent lands (the Bighorn) as a Wildland Provincial Park. The Siffleur Wilderness Area was established in 1961, protecting 425 km2 under the Forest Reserves Act, under the Public Lands Act in 1965, the Wilderness Areas Act in 1971 which was amended in 1973 under the Wilderness Areas Amendment Act. The Siffleur Wilderness Area is protected under the Wilderness Areas, Ecological Reserves, Natural Areas and Heritage Rangelands Act. The only other wilderness areas in the province are the White Goat Wilderness Area and the Ghost River Wilderness. The Willmore Wilderness Area is protected under its own act. This very stringent form of protection is indeed to preserve and protect natural heritage in order to provide a benchmark for pristine landscapes that have not been affected by humans. It does not permit any form of development or consumption (such as fishing or hunting) and access into Wilderness Areas is permitted by foot only. The Siffleur Wilderness Area is 425 km2 in size. The Siffleur’s boundaries are relatively indistinct. Its west and much of the south are bordered by Banff’s eastern boundary; the north by an imaginary line approximately 5 km south from the North Saskatchewan River; the east by a rugged range of peaks separating Siffleur from the Whiterabbit Creek drainage. 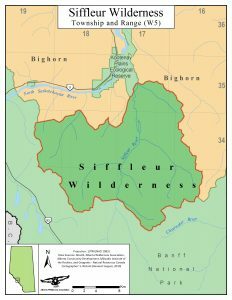 The Siffleur Wilderness Area is located within the Cline Subwatershed of the North Saskatchewan Watershed (North Saksatchewan Watershed Alliance 2012). The Siffleur River bisects the Wilderness Area; the Escarpment River and Porcupine Creek drain into the Siffleur River. The Siffleur Wilderness Area is in the western portion of the Cordilleran Physiographic Province within the Rocky Mountain thrust belt. It contains a small portion of the Rocky Mountain Front Ranges but remains primarily within the eastern Main Ranges (Alberta Energy and Natural Resources 1982). Bedrock underlying the Siffleur Wilderness Area ranges from Proterozoic to lower Jurrasic age and is composed mainly of late Precambrian to late Jurassic rocks (Alberta Energy and Natural Resources 1982). The landscape of the Siffleur was further carved by glaciers, creating valleys, tarns, and cirque lakes. Non-glacial surficial deposits include rock glaciers, stream alluvium, alluvial fans, talus, and rockslide deposits. 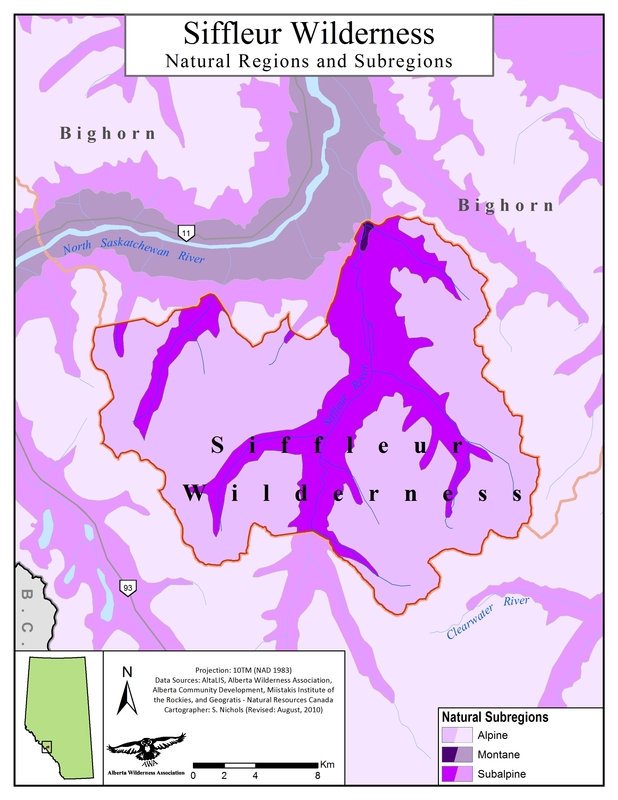 Elevations in the Siffleur Wilderness Area range from 2,464m along the Siffleur River to 3,358m (Alberta Energy and Natural Resources 1982). The Siffleur Wilderness Area is considered to be of provincial significance. The Siffleur is largely composed of the Alpine Subregion with some Subalpine within valley bottoms. 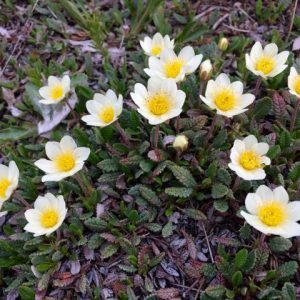 Lodgepole pine, Engelmann spruce, subalpine fir, juniper, shrubby cinquefoil, bearberry, buffaloberry, showy aster, mountain avens, as well as hardy grasses. 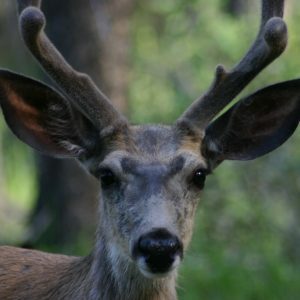 Caribou historically occurred within the Siffleur Wilderness Area, which was part of the range for herds that lived in Banff National Park. 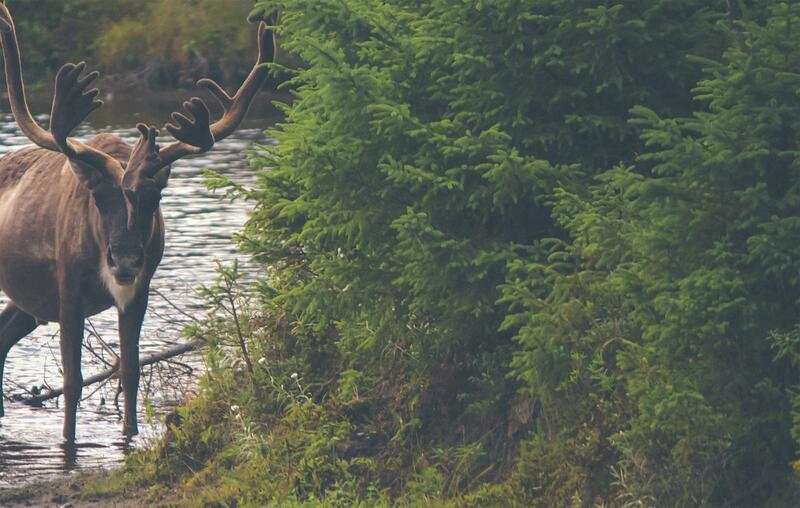 Other animals in the lower regions include moose, elk, deer, grizzly and black bear, cougar, gray wolf and wolverine (Alberta Recreation and Parks 1992). Above the treeline, golden-mantled ground squirrels, Bighorn sheep, mountain goat, pika, hoary marmot, and ptarmigan (Alberta Recreation and Parks 1992). A survey of the Kootenay Plains suggests that the earliest nomadic people in the region were the Upper Kootenay, part of the Ktunaxa Nation, who made long and continuous use of these areas. The Kootenay people likely came in from the Columbia River through the Howse Pass, hunting bison overwintering in the Bighorn’s wide valleys. Wilderness Areas permit only foot travel, and due to the distances involved, backpacking is often required. Visitors are encouraged to follow “no trace” practices are required in order to protect this fragile environment. The most popular access is from the Siffleur Falls trailhead off of Highway 11. Loss and degradation of wilderness was, and has remained, the largest threat to the Siffleur Wilderness. The Bighorn Dam on the North Saskatchewan River has flooded most of the Kootenay Plains grassland that once provided important winter range for elk, deer, moose and bighorn sheep of the Siffleur Wilderness. Past exploration of oil, gas, and coal left its mark in the form of cut lines and access roads. Helicopter tours and fishing expeditions to nearby alpine lakes have marked impacts on fish populations, stress to ungulates, and overall detraction from a user’s wilderness experience. Perhaps the largest risk to incremental degradation of wilderness is the increasing threat of encroaching commercial development. 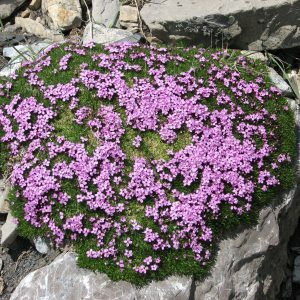 In general, the Siffleur Wilderness and the adjacent Bighorn Wildland is known and valued for being one of the last remaining areas of wilderness in the province and AWA maintains that it should remain that way. AWA believes highway-side regions are best left undeveloped. AWA is firmly opposed to any commercial development within the adjacent Bighorn Wildland as we believe it would degrade these important wilderness values. The draft Natural Heritage Act proposed reclassifying Wilderness Areas as Wildland Parks. Fortunately, considerable public opposition kept this strong level of protection. The Wilderness Areas Amendment Act is enacted in January 1973, retaining land use and recreation restrictions but deleting the size limitation of 373 km2. A wilderness bill is prepared during the course of these public hearings and becomes the Wilderness Areas Act (1971). This Act re-established the Siffleur under the new category of “provisional wilderness area”; however, it also subjected wilderness areas to a size review by an appointed Advisory Committee due to a 373 km2 size limitation incorporated within the Act (Kregosky 1975). Public hearings are held across the province in response to public pressure for wilderness protection. Protection of the Siffleur Wilderness is re-established under the Public Lands Act by Order in Council (0.C. 1876/65). The Siffleur Wilderness Area is protected by under provisions of Section 10 of the Forest Reserves Act (1950) Order in Council on January 10 1961, protecting 425 km2of wilderness (Kregosky 1975). The Siffleur Wilderness has been consistently used by Indigenous Peoples since ice retreated about 10,000 years ago.